In 1947 the city of Mombasa was paralysed by a general strike by its black African workforce in an attempt to end pay disparities, especially along colour lines. In 1945 Kenya was a colony of Great Britain. Workers were paid low wages and a wave of complaints led to threats of a strike. The British created the Phillips Committee to investigate the workers’ complaints. Forming the committee pacified the workers for a time, but by the end of 1946, workers in Mombasa were upset with the lack of change. In December 1946, workers held mass meetings, rumors spread about a potential strike, and government officials attempted to prevent action. On 7 January 1947, 3,000 workers met to organize a strike and on 13 January 1947, 15,000 workers declared a general strike. Three fourths of the labor force did not show up to work, paralyzing Mombasa. The workers involved in the strike included government workers, railroad workers, hotel workers, domestic servants, 4,000 dockworkers (dockers), and many others. Taxi drivers went around the city spreading word of the strike and urging others to participate. The government immediately declared the strike illegal, citing the Defense Regulations, which made it necessary for the port at Mombasa to stay open, as it was the only major access site to Kenya Colony and Uganda, then known as the Uganda Protectorate. Government threats did not stop workers. Every day strikers met at a soccer field to organize. On 14 January 1947, 10,000 workers showed up to the daily meeting, which was run with no official leader, giving everyone an opportunity to speak. Soon the meetings resulted in the formation of the African Workers’ Union. The people appointed 12 executive committee members. Though Mohamed Kibwana was declared president, his role in the strike is unclear. It was Chege Kibachia who played a major role in leading the workers and the African Workers’ Union. On 15 January 1947, government officials arrested 421 strikers, but few returned to work. People continued meeting. Kibachia addressed the crowds and urged them to refrain from violence, regardless of the race of the person they were in conflict with. During the strike no one died and no one was injured. It should be noted that intimidation was used when barbers shaved the heads of 12 strikebreakers into strange shapes before a large crowd. One man, Henry Gibson Shadrack Harrison, Assistant of Municipal African Affairs claimed that he witnessed strike workers harassing people who were not striking to keep them from working. Though this event does not follow the pattern of nonviolence, leaders kept to their nonviolent position. The complete lack of reported injuries and deaths make it appear unlikely that violence played a major role in the strike. On 18 January 1947, Chege Kibachia published an article stating the motives of the strikers in the East African Standard. Reasons included worker’s perceptions that employers gave unequal payment to workers of different races and that they were partial to certain workers and disrespectful towards African workers. They felt that employers intentionally kept Africans poor to keep them from leaving their jobs, and were not pleased that workers did not receive wives and children “allowances.” Additionally, they felt employers were not taking into consideration the current high cost of living in Mombasa. On 21 January 1947, Kibachia went in search of his former classmate, E.W. Mathu, the first African on the legislative council in Kenya. During this time, government officials tried threatening the strikers with legal action. Less than 200 workers broke strike. While Kibachia continued his search, Mathu arrived in Mombasa. Government officials had sent him to end the strike. On 23 January 1947, Mathu met with groups of government officials and groups of strikers before speaking to the people on 24 January 1947. At 11:30 he spoke to the people about changing the name of the African Workers’ Union to the African Workers’ Federation in order to keep the group separate from the Kenya African Union. When he spoke again at 4 pm, he promised to gain improvements in working conditions within three months if the people would end their strike. The people agreed and on 25 January 1947, all workers returned to their jobs. In keeping with the promises Mathu made to the people, government officials formed the Thacker Tribunal and appointed a sociological surveyor to review the sociological and economic conditions in Mombasa. At the end of March, these two parties recommended a wage increase of 20-40% for casual and monthly workers. Government officials met this recommendation. Employees were also given housing allowances, paid holidays, paid overtime and the Tribunal gave workers of at least five years a higher minimum wage. The African Workers’ Federation continued to hold weekly meetings and attempted to mobilize a second strike because they were dissatisfied with the changes brought by the Thacker Tribunal. They never succeeded and support for the union dwindled. For 12 days, Mombasa was almost completely paralyzed by a general strike of about three fourths of the cities’ workers. Government officials responded and success was gathered both in terms of wages and benefits. But the strike ended before many issues were addressed. 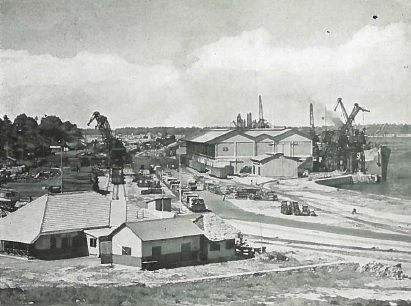 The Mombasa workers were influenced by previous strikes in the Kenya Colony as well as a recent dock workers' strike in Durban, South Africa (1). The strike influenced later strikes across Kenya, Zanzibar, and other areas in East Africa (2). Cooper, Frederick. "Dockwork and Disorder, 1934-1947." On the African waterfront: Urban disorder and the transformation of work in colonial Mombasa. New Haven: Yale UP, 1987. 78-113.
Cooper, Frederick. "Imperial Fantasies and Colonial Crises." Decolonization and African society: The labor question in French and British Africa. Cambridge: Cambridge UP, 1996. 234-40. Singh, Makhan. "Mombasa General Strike of 1947 and the African Workers' Federation." History of Kenya's trade union movement: To 1952. Nairobi: East African publ. house, 1969. 141-60.